SUNDAY B MORNING WARHOL FINE ARTWORK! STUNNING CAMPBELLS SOUP CAN ANDY WARHOL SUNDAY B MORNING SERIGRAPH SCREEN PRINT!, These are fabulous exciting silkscreen screenprints. These are Sunday B. 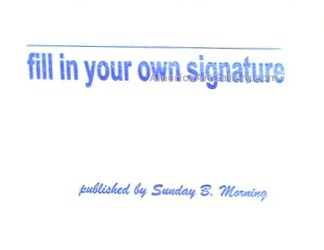 Mornings editions screenprints that are stamped on the verso in blue ink Published By Sunday B Morning,  fill in Your Own Signature. The inks' are the 1980's editions and the quality and integrity of the prints is impeccable. They are excellent High quality Silkscreen Screenprints printed on 'museum board' with the highest quality archival inks. Comes with Certificate of Authenticity. These are highly sought after by collectors for their quality, rarity and exciting vibrant colors.These are in excellent mint condition. Size is large at 35" x 23" inches. This item sells in Upscale Art Galleries and Museum galleries framed for up to for $3,000.00 when it can be found. These are very large Oversize Screen Prints, perfect for any elegant home, office, restaurant or place of business. Buy with confidence. Buy it Now! . The original edition of 250 were all signed and numbered on the verso. These when shown side by side, is nearly impossible to tell the difference. Very limited availability, do not miss your opportunity to own yours now! Certificates of Authenticity available upon request with purchase. WE CARRY OVER 200 ANDY WARHOL Art works in our inventory. 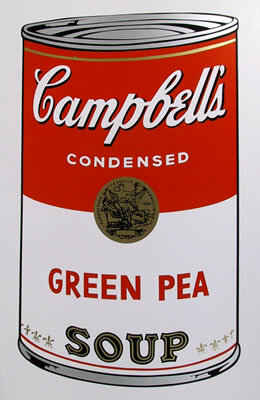 WE HAVE OTHER SUNDAY B MORNING WARHOL CAMPBELL'S SOUP CAN SCREENPRINTS IN THIS SERIES of 20. Inquire for availability and pricing if you are seeking a specific CAMPBELL'S SOUP CAN piece. Pricing varies! If you are interested in buying a complete set, collection or suite of 3, 4 or 10 Sunday B Campbells Soup cans contact us! Born Andrew Warhola in 1928, Warhol was a founder and major proponent of the Pop Art movement. He remains one of the most talented and influential artists of the 20th century. Warhol pioneered the development of the process of photo-mechanical silkscreen. Warhol is known for his paintings of commercial and iconic images, from the Campbells Soup can, to portraits of celebrities like Marilyn Monroe. He created an instantly recognizable style. One of the most highly sort and collected artist in the world. Click the button below to add the Andy Warhol Campbell Soup Can (Green Pea) Sunday B Morning Silkscreen Print to your wish list.